Since Alexis de Tocqueville, restlessness has been accepted as a signature American trait. Our willingness to move, take risks, and adapt to change have produced a dynamic economy and a tradition of innovation from Ben Franklin to Steve Jobs. 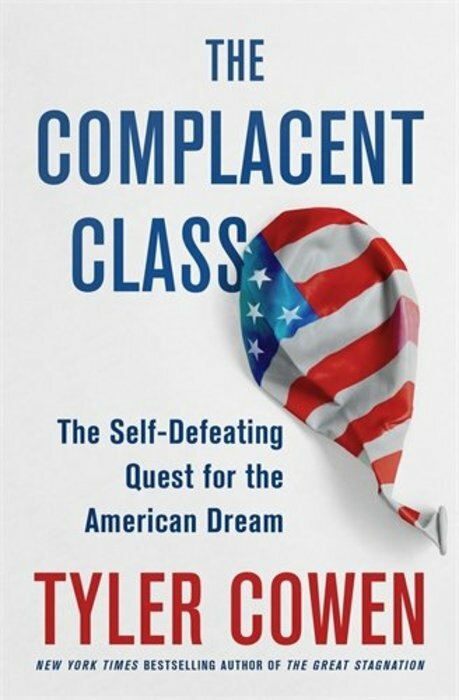 The problem, according to legendary blogger, economist and best selling author Tyler Cowen, is that Americans today have broken from this tradition―we’re working harder than ever to avoid change. We're moving residences less, marrying people more like ourselves and choosing our music and our mates based on algorithms that wall us off from anything that might be too new or too different. Match.com matches us in love. Spotify and Pandora match us in music. Facebook matches us to just about everything else. Of course, this “matching culture” brings tremendous positives: music we like, partners who make us happy, neighbors who want the same things. We’re more comfortable. But, according to Cowen, there are significant collateral downsides attending this comfort, among them heightened inequality and segregation and decreased incentives to innovate and create. The Complacent Class argues that this cannot go on forever. We are postponing change, due to our near-sightedness and extreme desire for comfort, but ultimately this will make change, when it comes, harder. The forces unleashed by the Great Stagnation will eventually lead to a major fiscal and budgetary crisis: impossibly expensive rentals for our most attractive cities, worsening of residential segregation, and a decline in our work ethic. The only way to avoid this difficult future is for Americans to force themselves out of their comfortable slumber―to embrace their restless tradition again.